Does the Mackinac Bridge Labor Day Walk sound like a good idea yet it’s too far away for you to participate? You won’t need to travel all the way to St. Ignace to join in Michigan’s Labor Day walking tradition. Each year on Labor Day, St .Clair County Parks hosts a Labor Day Community Walk to help increase the number of active people on Labor Day weekend. The five mile, “Trek the Trestle” Labor Day event has been held annually since 2007. 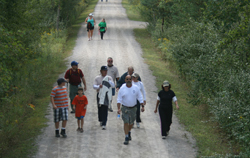 The walk takes place on the Wadhams to Avoca Trail, crossing the 640ft. Mill Creek trestle, the longest bridge of its kind in the state of Michigan. 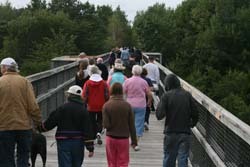 Labor Day Community Walks are held throughout the state in conjunction with the Mackinac Bridge Labor Day Walk. 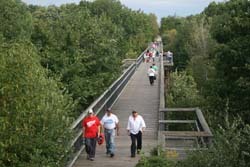 Community Walks help provide a similar experience to residents unable to participate in the annual walk across the Mighty Mac. Walks like this are important steps toward helping citizens lead healthier, more physically active lives. By hosting local walks Michigan communities are able to demonstrate their commitment to healthy living, physical activity and community involvement. “By holding local events all across the state, we hope to double or even triple the number of walkers on Labor Day and bring attention to the importance of physical activity for the health of Michigan,” explains Marilyn Lieber, president and CEO of the Governor’s Council on Physical Fitness, Health and Sports. So on Labor Day, Come and Join us! Call (810) 989-6960 for more information.